If a flesh-eating virus killed more than 40,000 people in the United States in a single year, every level of government would act decisively to stamp out the contagion and save lives. And yet, when 40,000 people lost their lives in traffic crashes in the United States last year, our collective response was little more than a shrug. For the most part, our transportation policies continue to reinforce a deadly car-centric status quo that leaves Americans far more exposed to the risk of fatal crashes than residents of peer countries. Denver is no exception. Between 2005 and 2016, 582 people were killed in crashes on city streets. Most people tend not to think about all this carnage as a public health issue, but public health professionals do. Traffic injuries are the fourth leading cause of death in Colorado, and the second leading cause of hospitalization, according to the city’s recently released Vision Zero Action Plan. Traffic injuries accounted for 31 percent of paramedic encounters and 26 percent of ambulance trips. When the city unveiled the action plan last month, I got to speak to Michele Shimomura, a public health manager with the Denver Department of Environmental Health who helped write it. She brings a perspective to the problem of traffic violence that doesn’t get heard enough, even in transportation policy circles. “When fatalities and serious injuries occur on streets, that’s a very direct morbidity and mortality issue for public health,” she said. Shimomura views street safety as an integral component of improving public through changes to the built environment. Streets that are too dangerous for walking and biking discourage physical behavior, and that can make us sick. High traffic volumes generate pollution that leads to elevated rates of asthma and cardiovascular disease, as in the neighborhoods bisected by I-70. Too many policymakers treat redesigning streets for safe walking and biking as some kind of war between people who drive and people who do not. And our local media loves to run with that narrative of conflict. But there’s real harm to public health and safety embedded in Denver’s high-speed streets that cater to cars. Making those streets safe for people to walk and bike isn’t a zero-sum game — it can lead to big improvements in broad measures of public health. You can weigh in on the Hancock administration’s draft Vision Zero plan on the city’s website. As we wrote last month, the city should be setting more specific targets to address the public health crisis of dangerous streets. Being stuck in the dead center I could be confused for a RINO I suppose. It’s certainly true that both the left and right have moved farther away from where I am. It’s also fair to say I’m not in favor of an over-regulated, over-controlling Nanny State. Still appreciate my freedoms. No question that the graph on preventable deaths (not just crashes) doesn’t look pretty. 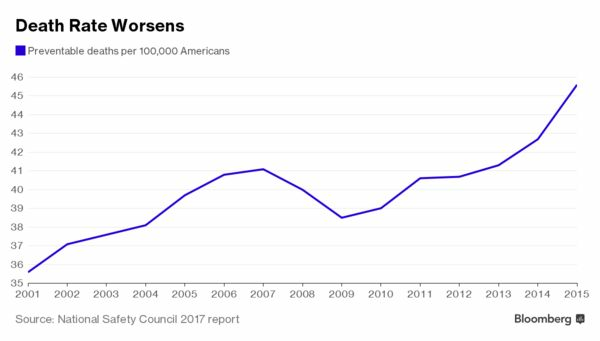 Opioid use is now #1 cause. Could you be any less on topic? Better? Ironically I had already decided to edit. Nice made-up list you’ve got there. The fact that you call dangerous, high-speed geometries “design defects” says it all. Not me, my source is HuffPo so take it up with them. We can also take it up with you for citing that list here as fact. Did you catch the author of that unsourced list’s credentials? ‘Entrepreneur, Fashion Enthusiast, Freelance Writer, Startup Guru, Inspirational Speaker’. The list seems credible to me but you’re welcome to come up with your own list and cite your source or just make up your own list or explain why you disagree with the list above… that would be substantive. Maybe you can elucidate the substance behind posting a list of causes without comment. Is it that we should not work to eliminate injuries and deaths as a result of bad design because “common sense” tells you driver distraction is higher on a ‘top ten’ list? Even if actual data backs that up, the Denver Vision Zero plan attempts to counter driver-related factors by promoting a culture of safety (it’s in the plan vision). You can agree with the efficacy of the plan or not, but bring some evidence (here, I’ll help: https://crashstats.nhtsa.dot.gov/#/) and make a point, but GTFO with these garbage listicles. You’re something else. I haven’t found a straight forward list on NHTSA/NCSA. BTW the first link wouldn’t download for me. A crash occurs when two people try to occupy the same space (H/T to rwo). I posted a credible list of causes; the fact that it doesn’t please you is irrelevant but you’re entitled to your opinion ofc. Can road hazards like potholes or unexpected curves be contributing factors?Sure. Vision Zero is a whole other topic. It’s about hoping to create safer streets but that’s different from what actually causes crashes. Should I post an obnoxious acronym? Nah, no need to stoop to your level. Vision Zero IS THE TOPIC. It’s right there in the title, and is the focus of all those words up there in the article you’re commenting on. An evidence-based critique of a policy prescription is the way to begin a discussion about that policy, but it requires 1. evidence and 2. a critique. You don’t seem to be interested in either, or discussing the topic at hand in good faith. Why is that? Fair point but I was reminded earlier that I tend to say too much. Afterall it’s a just a blog. But I’ll also agree in the sense that many will respond with a quick quip or supposedly funny one-liner totally devoid of substance. Then again it’s just a blog so all is fair? Vision Zero is not possible even if we only drive 20 mph, which will also drive the cost of everything you buy up by double so get over it. There have been pedestrians killed by bicyclists more than once. Vision Zero is a fantasy with no chance of happening. Transportation Alternatives, New York, New York, United States. What the heck can you afford in NYC working just 16 hours per-week making only $25/hour? That would be like making just $10/hour here, and only $5/hour in Wichita, KS. I don’t think that you can afford to live in the projects on that there. Say, whose fault was this accident BHG? I read recently that Denver cops were cracking-down on bicyclists downtown for running red lights. I am all for that. I have more than 3 million miles of experience as a professional driver plus another 1.5 million driving my own cars, so I would have a very good idea of the causes of lots of crashes. Now I have seen multiple accidents between cars and bicycle riders that were 100% the bike rider’s fault for ignoring common traffic laws. I have even seen multiple drunken or drugged pedestrians ignore street crossing laws and just wander into moving traffic and get hit too. Some of the problem is bad design. For instance, on the border of Chicago and suburban Melrose Park the sidewalk on the east side of 25th Street is only maybe 5 feet wide between buildings and moving traffic on the street in a couple of places. An accident I saw occur there once involved a bar patrol stumbling down the front steps of the bar, losing his balance, and falling into moving traffic, where he was hit by a moving vehicle before he even hit the pavement. Extremely narrow roads, sidewalks, and building setbacks are a problem all over older parts of urban America. Of rain and snow cause a number of accidents as can spilled fuel. One of the worst accidents I ever saw was on Interstate 80 in Pennsylvania after a truck’s was hit by a car and ruptured spilling 200 gallons of diesel fuel on fresh asphalt. It was far more slippery than wet ice. It happened in a blind curve. A lot of Eastern US freeways were not built to the same clear zone standard that Western US freeways have been, and they often have narrow lanes, narrow shoulders, and often run through dense forests with the trees only cut back 8 feet or less from the pavement. All that diesel fuel on the pavement coming around a blind curve cause over 50 vehicles to wreck at high speed. If you have your cruise control on when you hit spilled diesel fuel on asphalt you will instantly lose control as your engine will accelerate and break your drive tires loose, and in a curve your car, bus or truck will slide to the outside. The eastbound I-70 curve there by the Hwy 58 onramp and the Ward Rd exit is excessively banked, which has already caused several RTD buses to end up in the ditch when it has been icy. Their drive tires break loose and unless you are very good at ice driving the back of the bus drags you down the hill and right off the road. Cleveland’s Dead Man’s Curve is a piece of mainline I-90 with a blind 30 mph curve in the heart of downtown, that has caused hundreds of fatal accidents. In lots of these accidents people didn’t slow down enough and in others traffic suddenly came to a screeching halt heading around a sharp blind corner in the dark under a bridge that once had 10 sets of railroad tracks on it and is poorly lit underneath. if you enter the Cross Bronx Expressway from the Major Deegan Expressway driving a truck you have to force your way across 4 lanes of traffic in 750 feet to make it to the lower deck on the George Washington Bridge as heavy trucks aren’t allowed on the upper deck. NYC has another strange non-standard problem. They post bridge clearances from the center of the axle of a 20-inch truck tire to the roof of the truck rather than from the pavement to the bridge like everywhere else in the US does. The difference is about 14 inches. Most heavy trucks these days use either 22.5 or 24.5 wheels rather than 20-inch wheels. The problem occurs in several freeway locations, always in heavy traffic, when a posted clearance sign indicated 12′ 6″ rather than the actual clearance of 13′ 8″, as all the rookie out of State truck drivers slam on the brakes as hard as they can thinking that they are going to rip the roof of the truck right off. I know of several clearances on the BQE with long sets of skid marks across all lanes heading into them. Let’s say that you are a half-mile back when that happens, trying to dig in your briefcase with one hand, hold your cell phone with your other hand, while you are steering with your knee, and not paying nearly enough attention. Suddenly the guy in front of you slams on his brakes as hard as he can. There isn’t a thing that you can do but plow right into him, hit the wall or the car/bus/truck next to you. Signals are not infallible either unfortunately, with railroad crossing signals particularly suspicious. Just in my time driving delivery trucks in downtown Denver, a small fraction of my 30-year career, I have seen a light rail train run a red signal several times and I have seen the railroad signal at Osage, 7th Street, and Colfax malfunction and give both a train and cross traffic the right of way at the same time. Regular railroad crossing signals fail at a rate of up to 2% legally. Not a lot we can do about teenage or elderly drivers I’m afraid as that is a human problem, just as is the issue with reckless behavior by some young adult bike riders too. I remember this kid cruising down the sidewalk on 18th heading downhill from Market on a skateboard doing probably 15 mph when a car exited the parking garage there and that kid t-boned the car. Whose fault was that one? It is completely blind coming out of the parking garage until your hood is sticking 5-6 feet out from the side of the garage. Of course the design standard was for pedestrians not for kids on skateboards recklessly weaving through pedestrians either. I’ll never forget how angry this guy was in Chicago that impaled his car on the back bumper of my truck trailer as I was trying to back into a tough street dock, and he was driving the wrong way on the sidewalk on my completely blind side. He was screaming about the damage that I had allegedly done to his car and he called the cops. When the cops showed-up the first sentence out of the one cops mouth was “Sir, what were you doing driving on the sidewalk”? Needless to say I didn’t have to pay anything for his damage except for another lost hour of potential productivity, which also happens every time some unthinking bicyclist or pedestrian gets hit ignoring common traffic laws too. Long but not too long to read. Thanks for taking the time to offer your wisdom. Finally fixed the typos, I could probably write 100 times that much content on roadway design flaws easily. Were the motorists involved in those crashes in full compliance with the law? Were they driving within the legal speed limit, for instance? Were they exercising due care to avoid colliding with pedestrians and cyclists, and were they yielding to pedestrians and cyclists where and when the law requires? Were they driving without the common distractions of electronic devices and the like? Because you’ve only given half the story. An accident I saw occur there once involved a bar patron stumbling down the front steps of the bar, losing his balance, and falling into moving traffic, where he was hit by a moving vehicle before he even hit the pavement. And any competent motorist, upon noticing a very narrow sidewalk, will anticipate the impact of a pedestrian who innocently trips and falls and will drive accordingly. Rain and snow cause a number of accidents as can spilled fuel. One of the worst accidents I ever saw was on Interstate 80 in Pennsylvania after a truck’s fuel tank was hit by a car and ruptured, spilling 200 gallons of diesel fuel on fresh asphalt. It was far more slippery than wet ice. So you’re saying a motorist, or perhaps two, were driving too fast for conditions? It happened in a blind curve. Then slow down, so that you can be aware of your surroundings. Aha! I think we’re onto something here. I-90 is well over 100 miles north of New York City. Try again. from the Major Deegan Expressway (I-87) driving a truck you have to force your way across 4 lanes of traffic in 750 feet to make it to the lower deck on the George Washington Bridge as heavy trucks aren’t allowed on the upper deck. You have upper and lower reversed. Try again. Let’s say that you are a half-mile back when that happens, trying to dig in your briefcase with one hand, hold your cell phone with your other hand, while you are steering with your knee, and not paying nearly enough attention. Anybody who drives like this should be thrown in jail and forever relieved of his or her driving privileges, before causing any actual damage. Suddenly the guy in front of you slams on his brakes as hard as he can. There isn’t a thing that you can do but plow right into him, hit the wall or the car/bus/truck next to you. Which is why it’s kind of important for drivers to (a) pay attention and (b) maintain a safe stopping distance.